Homemade Ferret Food – What Treats Can I Make for My Ferrets at Home? Q: I’m new to ferrets, and just want to know before I end up making my babies real sick.. What kind of treats are ok for them? Are mealworms ok, or some vegetation? And what food should I avoid? A: No veggies or fruit!! Ferrets are obligate carnivores, they don’t have the enzymes in their guts to digest fruits, grains or veggies. Ferrets don’t actually NEED treats, but n-bones; ferretone; oils like olive, emu and salmon are good. The following are 2 recipes that I’ve used for homemade ferret treats, that my ferrets eat and love with no problems. This is a recipe for pet safe jerky, costs less than what you pay for at a pet store and you know what you’re feeding your pet is safe AND healthy because you’re making it yourself! The best part is, it doesn’t require a dehydrator, so any one can do this! It is, however, time consuming and may take an entire afternoon. Plan on doing this only when you have a whole day to do this. Never leave an oven unattended! Place oven racks as high up as they will go. Take your meat, whatever you wish to use, and slice into 1/4th inch thick slices. It’s easier to cut when it is partially frozen. You can also ask a butcher to do this for you. Pat the meat dry with paper towels if wet. Line cookie sheets with parchment. 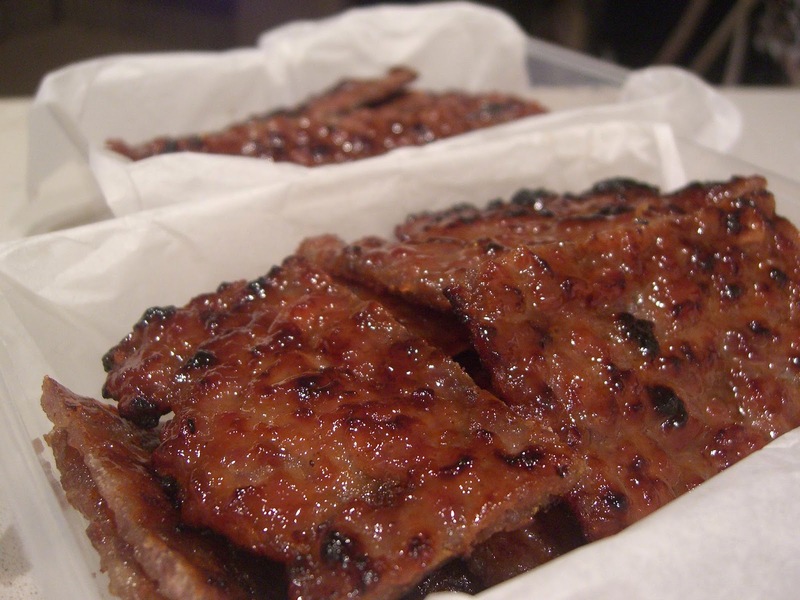 Place meat on paper until sheet is full (leave a little space in between each piece of meat). Place more parchment paper over meat. Take rolling pin and flatten meat. Place cookie sheets in the oven and leave door cracked slightly to allow moisture to escape. Leave alone, but check often as the meat dries out. May take upwards of 8 – 10 hours. May take as little as 4 hours. When meat is fully dried, remove from oven and allow to cool. 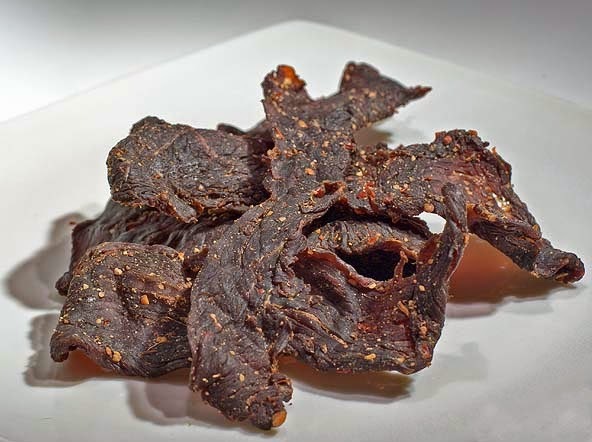 I have a homemade jerky recipe that’s healthier and cheaper than Bandits or Dingos, and it’s easy. I love them because that’s what I’ve trained mine to come with and do a couple tricks. Also, it’s great when taking them to the vet or car rides and you’re trying to have a well behaved fuzz. I just keep them in a pocket or zip lock. Boil chicken breasts until cooked. Slice into bite size bits. Mix olive oil and ferretone together. Stir GENTLY or you wind up with mush. Spread chicken onto cookie sheet and bake at 175 degrees for 2 to 2 1/2 hours depending on bite size or when chicken looks dried up. *Note* You can substitute any meat other than chicken, and it doesn’t have to be organic. You can also substitue flax seed, canola or fish oils instead of ferretone. I know what’s in my recipe is healthy, without any CORN, SUGAR and SALT. Even without the preservatives, Raider Chomps lasts forever too. Do you need to store the Raider Chomps in the refrigerator afterwards? Um ferretone REALLY isn't good for ferrets. The first ingredient is malt syrup…. Obligate Carnivores & sugar of ANY kind is B A D. Wonder what else could be used in its place? Extra Virgin Olive Oil is better that just Olive Oil, & I've been advised by the people on The Holistic Ferret Forum that Salmon Oil is the best choice. So I will substitute the ferretone with Salmon Oil. PS: By the way, for those of you who are interested in a more species specific diet (raw) & not kibble, check out their site. My boys haven't eaten ferret food (kibble) for 3 months now & they are healthier for it.